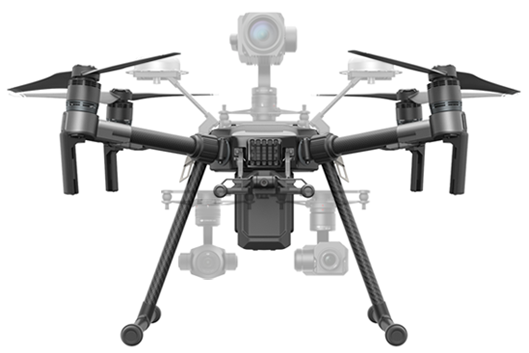 ​The M210 opens up for multiple payload configurations – one single downward facing gimbal mount, two parallel downward-facing gimbal mounts or one upward-facing gimbal mount. Additional connectivity ports support third party sensors and accessories. 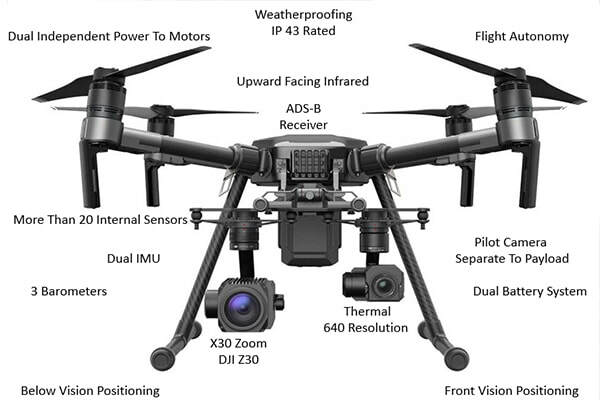 Featuring DJI AirSense, a built-in ADS-B receiver, enhancing airspace safety by automatically providing the operator with real-time information about the position, altitude, and velocity of nearby manned aircraft equipped with ADS-B transmitters. AirSense enables safer and more efficient use of airspace, particularly in locations where other manned aircraft may be operating. With an IP43 classification, the M200 series is built to endure adverse environments. The aircraft is equipped with more than 20 internal sensors for maximum redundancy and reliability, including compass, GPS system, dual inertial measurement units (IMUs) and three barometers. Gimbal controllers have been integrated in the aircraft body for protection and to prevent drift. The aircraft features two stereo-vision systems below and in front of the aircraft and has an upward facing infrared sensor for obstacle avoidance. A redundant battery system improves safety and also allows the aircraft to stay powered while batteries are swapped in sequence. ​The M200 series is compatible with DJI’s Mobile and Onboard Software Development Kit (SDK), enabling programmers to build customised solutions for flight planning, data collection and analysis. The DJI Pilot app is compatible with DJI Flight Hub, a web-based software package allowing teams to share real-time data with offsite parties over the Internet. This includes remote emergency situation control rooms keeping track of first response teams or asset management centres inspecting global infrastructure networks. In an easy-to-use control centre, DJI Flight Hub lets users plan flights with multiple drones and keep track of each aircraft’s status. An offsite control room can simultaneously monitor live feeds and can remotely control gimbal and camera. The software enables managers to plan flights in advance using waypoints and dynamic geofencing. 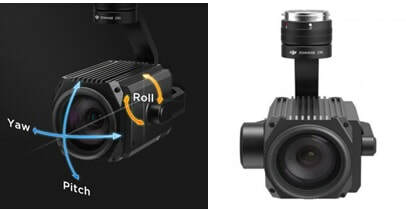 Using DJI’s powerful Lightbridge system, the M200 series supports a range up to 4.3 miles (7 km) where, allowed by local laws and regulations, at live view resolutions up to 1080p. The master and slave controller range extends to 328 feet and users can switch between 2.4 GHz and 5.8 GHz frequencies to cut through any noise for greater signal stability. Delivering optical zoom up to 30x and digital up to 6x, the Zenmuse Z30 offers unparalleled image data capture. This allows operators to capture the information they require from a greater range, making image data collection significantly faster and eliminates risk of harm to both personnel and equipment. The camera on the DJI Zenmuse XT is developed by FLIR. It provides high-sensitivity (50mK) infrared scanning at 640/30. This sensitivity provides accurate temperature measurements ideal for analytics and telemetry. Stabilized and controlled by a custom DJI gimbal, it provides smooth, clear imagery and 360 degrees of seamless rotational movement.